In recent years, microalgae-based carbon-neutral biofuels (i.e., biodiesel) have gained considerable interest due to high growth rate and higher lipid productivity of microalgae during the whole year, delivering continuous biomass production as compared to vegetable-based feedstocks. Therefore, biodiesel was synthesized from three different microalgal species, namely Tetraselmis sp. 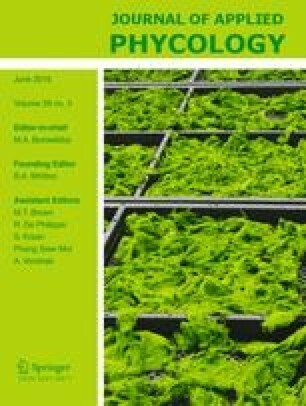 (Chlorophyta) and Nannochloropsis oculata and Phaeodactylum tricornutum (Heterokontophyta), and the fuel properties of the biodiesel were analytically determined, unlike most studies which rely on estimates based on the lipid profile of the microalgae. These include density, kinematic viscosity, total and free glycerol, and high heating value (HHV), while cetane number (CN) and cold filter plugging point (CFPP) were estimated based on the fatty acid methyl ester profile of the biodiesel samples instead of the lipid profile of the microalgae. Most biodiesel properties abide by the ASTM D6751 and the EN 14214 specifications, although none of the biodiesel samples met the minimum CN or the maximum content of polyunsaturated fatty acids with ≥4 double bonds as required by the EN 14214 reference value. On the other hand, bomb calorimetric experiments revealed that the heat of combustion of all samples was on the upper limit expected for biodiesel fuels, actually being close to that of petrodiesel. Post-production processing may overcome the aforementioned limitations, enabling the production of biodiesel with high HHV obtained from lipids present in these microalgae. Katkam N. Gangadhar and Hugo Pereira contributed equally to this work. K.N.G. (SFRH/BPD/81882/2011) and H.P. (SFRH/BD/105541/2014) are, respectively, a post-doctoral researcher and a PhD student funded by the Portuguese Foundation for Science and Technology (FCT). The work was conducted under projects also funded by FCT and the Portuguese national budget (Projects PEst-OE/QUI/UI0100/2013, PEst-OE/QUI/UI0612/2013, PEst-C/MAR/LA0015/2013, and PEst-OE/EQB/LA0023/2013). The authors would like to acknowledge the NECTON S.A., Portugal, for providing microalgal samples.